Let’s talk about cheating again but tackle the other side of it, What to do when you’ve been cheated on! 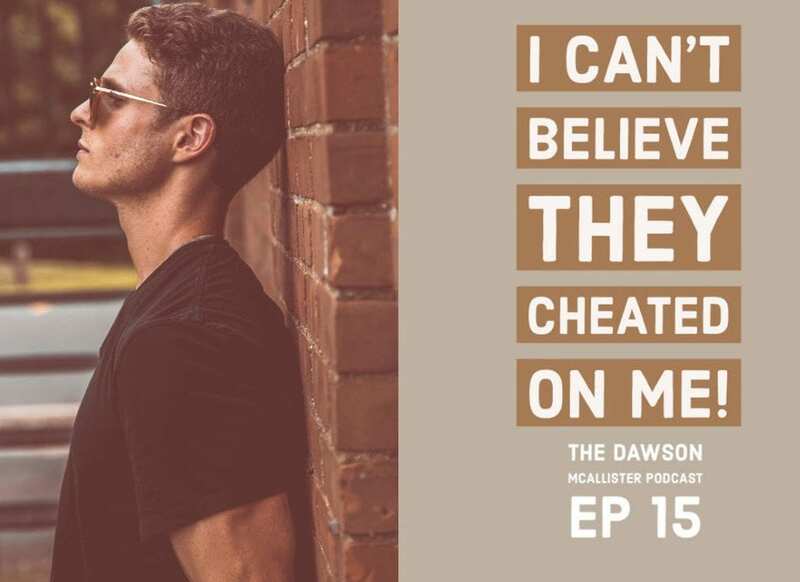 Last podcast (episode 14), I talked with Josh, Sean and Ameera who did the cheating. This episode, I speak with Tabitha, James and Katelynn, who have been cheated on. Let’s hear firsthand, what it is to go through the pain of being cheated on. Tabitha’s fiancé had not proven he could be faithful. She wanted the relationship to work so badly, she trusted him again even though he had broken her trust. There are hoops he needed to jump through to prove to her he was serious about being faithful, like counseling and accountability groups. Instead, they started talking marriage. They tried to put their relationship back together, without dealing with the difficult issues. They thought a commitment to marriage was going to solve their trust issues. It seldom does. They even traded user names and passwords to help him stay accountable but that didn’t work either. She caught him having inappropriate conversations with girls online. Now, she’s in a difficult situation because they’ve set a date for their wedding. Some money has already been spent and preparations have started. Obviously, it would be huge mistake to go ahead with the wedding. One mistake, setting the date, doesn’t mean you have to make another and go ahead with the marriage. Better disappointment and some heartache now then the grief after they’re married. It’s time for Tabitha to break things off completely with her fiancé. It’s going to be hard but the longer she waits, the harder it will be. She needs to begin to focus on her healing and moving on with her life. I Don’t Care Enough About You To Stay Faithful. James received the incredible shocking news that his girlfriend has been cheating on him. To make matters even worse, she is pregnant and the baby is not his. James never saw it coming; after all, they had been together for 4 years. James responded to her betrayal in all the wrong ways. He started drinking and he’s so upset he’s not thinking clearly. When someone cheats like James’ girlfriend did, she’s making a statement which says, I don’t care enough about you to stay faithful. For James to try to salvage the relationship would only make matters worse. There is one thing for James’ to be thankful for, this other guy has taken his girlfriend off his hands. Fortunately, James found out what she is really like before making any bigger commitments to her. James can’t avoid all the pain, either way he’s going to suffer. But he can cause himself much more time and hurt by trying to prop up a dead relationship. Instead, James needs a whole new foundation for his life. He seriously needs to turn to God, who will never cheat on him, and receive God’s unconditional love. Then he can see himself as God does, valuable, worthy, and in need of His love. It sounds impossible now but James can come to the other side of this cheating nightmare even stronger. Being cheated on doesn’t have to be the end of your life story. You can recover, move on and have an awesome life. If she keeps blowing up his phone, what is she saying to him about herself? That she thinks she can’t live without him. That’s bogus. She needs to hold her head high, and not belittle herself by what she is doing, which is borderline harassment. If she keeps obsessing, she isn’t focusing on her own life. There are people at her school who need her and she has a lot to offer. Tabitha, James and Katelynn have each been heartbroken from being cheated on. When you are cheated on, it’s really hard to trust in future relationships. But being cheated on doesn’t have to be the end of your story. You can recover and learn to trust again! Consider turning to God, who will never cheat on you! You can receive God’s unconditional love and see yourself as God does…valuable, worthy, saved by grace, chosen and a representative of Him! Take a look at my eBook: Understanding Cheating in Relationships. Need prayer? I believe God wants to change your life and mine, through prayer. If you need prayer and would like to have someone pray for you, go to the ThePrayerZone.com and check it out. Need to talk about your issues? Sign up for an Email Mentor, an online coach who will email you and come along beside you to offer support. If you like this episode and think someone else might too, please share it on Facebook and Twitter. In the next episode, join me as I speak with Kayla, Lee and Tarah, each of them pregnant and needing guidance. Kayla is not sure who the birth father is, Lee’s boyfriend is addicted to drugs and alcohol, and Tarah has a life and death decision to make. Remember, whatever you do, Never Lose Hope!